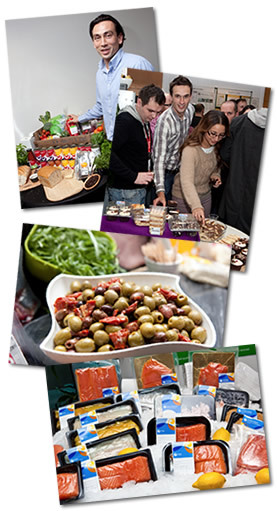 Kicking off in Ocado Head Office, we’re touring the company to showcase what’s new in the world of the Ocado range. The first exhibition was held a few weeks ago, and it was great to see so many people turn up to sample the produce and find out what we’ve been up to. We had everything from cheese to olives to cakes for people to try, and it all went down a treat. But special thanks have to go to Paul and Gavin from Seachill who brought along our scrummy range of salmon and prawns – in particular a big favourite, our cold smoked salmon fillets. We’re always keen to hear what people love about the range and what we could do better, so a pat on the back to everyone who left their feedback. I’d just like to finish by saying we hope everyone there enjoyed themselves (and the food!) and we look forward to more exhibitions soon. This entry was posted in Talking Ocado and tagged exhibition, Ocado range by Ocado. Bookmark the permalink.